In theory our parliamentarians should have a better grasp of the realities of religious persecution around the globe than possibly any other group of people in this country. Since the start of this year alone there have been plenty of events organised within Westminster’s walls specifically to inform and educate MPs and peers on this pressing subject. Speakers have included Justin Welby; Andrew White – the ‘Vicar of Baghdad’; Maryam Rostampour and Marziyeh Amirizadeh – two Iranian women imprisoned for 259 days and threatened with death sentences for their Christian faith; Hea Woo – a North Korean Christian refugee; and even Labour’s Shadow Foreign Secretary Douglas Alexander, who has put in a great deal of effort attempting to drum up interest from within his own party. Of the 196 countries studied from October 2012 until June this year, 81 have religious freedom impaired (classified as ‘high’ or ‘medium’) or it is in decline. Some 35 countries had some religious freedom issues ‘of concern’, but with no deterioration in their status. The remaining 80 countries indicated no concerns. 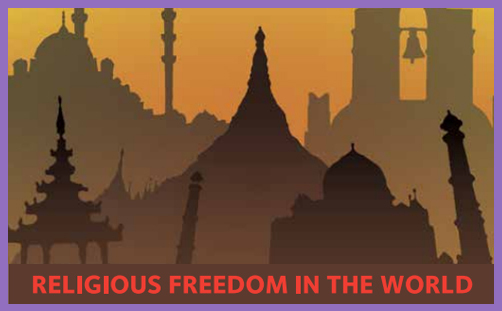 In the period under review, global religious freedom entered a period of serious decline. Change for the better was noted in only six countries. Deteriorating conditions were recorded in 55 countries (including the UK). In total, 20 countries are designated as ‘high’ with regard to lack of religious freedom. Of these, 14 experience religious persecution linked to extremist Islam. In the remaining six countries, religious persecution is linked to authoritarian regimes. Muslim countries predominate in the list of states with the most serious religious freedom violations. Christians remain the most persecuted religious minority, due partly to their wide geographic spread and high relative numbers. However, Muslims are also experiencing a serious degree of persecution and discrimination, both at the hands of other Muslims and from authoritarian governments. Religious freedom is in decline in Western countries that are predominantly or historically Christian. Two principal factors explain this. First, there is disagreement over the role to be played by religion in the ‘public square’. Second, openness to religious freedom is under threat from increasing societal concern about extremism. The brutal hatred of ISIS toward any minority they come into contact with continues to hit the headlines and dominate our television screens. But there are other daily stories of oppression and violence from elsewhere that fail to gain the same level of attention. If we look to Pakistan – regarded by the report as one of the worst offenders – there is no shortage of examples. Two days ago it was reported that a Christian couple there were beaten to death by a mob after being accused of desecrating a copy of the Koran. In May, gunmen in the city of Multan shot dead a lawyer who had been defending a university lecturer accused of blasphemy. And last month a court upheld the death penalty for Asia Bibi, a Christian woman again convicted of blasphemy four years ago, despite highly dubious evidence. Yesterday the Church of England’s Director of Communications, Rev Arun Arora, drew attention to the injustices of the Asia Bibi case. In doing so, he joins with many other voices including Pakistan’s former Governor of Punjab, Salmaan Taseer, and Minister for Minorities, Shahbaz Bhatti, who were both assassinated as a direct result of their stance and their own Christian faith. The cause of religious freedom is one that has changed my family’s lives and mine forever. When Shahbaz was killed, I had a choice to either continue the life I had in Italy, or pick up the baton left by my brother and continue the task he had set himself. My conscience left me in no doubt; I believe I was directed by God to continue his vision and mission, protecting those whose basic human rights are too often violated because of discrimination, extremism and religious hatred. Consequently, I took up the role of Federal Minister of National Harmony and Minority Affairs in the Pakistan Government. Nobody should have to suffer physical violence and psychological intimidation for declaring what they hold dear and adhere to. Religious freedom is a right and a responsibility that involves everybody; all of us are entitled to express our beliefs, respecting the faith of each other. It is the most critical need of the moment in a divided world where, in some parts there is a religious revival and in others, a trend towards religious indifference and atheism. In an increasingly polarised world, a growing consensus about the nature of and respect for religious freedom could prove crucial in our struggle against fanaticism and a culture of violence, be it by the State, extremists or by terrorist groups. The Report concludes that in order to begin to establish any form of consensus, responsibility for combatting violence and persecution rests, first and foremost, within religious communities themselves. The necessity for all religious leaders to loudly proclaim their opposition to religiously-inspired violence, and to re-affirm their support for religious tolerance, is becoming ever more urgent. Although not explicitly phrased, this would appear to be directed toward Muslim leaders who too often have been unwilling or slow to condemn acts of violence carried out in the name of Islam. The Report has identified places where positive inter-religious bridges are being built at a local level, but these are few and far between. There is certainly a need for this to happen in the UK, too, if the current national tensions surrounding the Islamic faith are to improve. And this an issue that our politicians must do more to address. The Report states that there is a pressing “need for the West to develop a fuller and more sophisticated understanding of religious motivation. The religious illiteracy of Western policy makers is creating a formidable barrier of understanding between the West and other parts of the world”. This is “hampering productive dialogue and effective policy making”. Perhaps an indication of the reasons behind this lack of attention and action can be found in the findings of a poll released this week by the UK arm of the Huffington Post. It found that more than half of respondents said they thought religion caused more problems than it solved, with less than a quarter believing faith to be a force for good. As our country has become increasingly secular and irreligious, toleration for religious practices and beliefs continues to decline. In doing so, religion and those who hold religious beliefs are increasingly seen as irrational and outdated in their thinking. When observing the religious conflict and persecution around the world, there appears to be an underlying assertion that if citizens of those countries aren’t willing to initiate progress and embrace liberal secularism and democracy, then all sides might as well be left to fight it out amongst themselves and deal with the consequences. Living in the UK, where, for so long, religious faith has been unassuming and often seen as a personal matter, it is beyond the understanding of many as to why anyone would take religion so seriously that they would either kill or be willing to die for their faith. We might be proud that we have elevated ourselves above the perceived nonsense of religion, but in doing so we actually display a great deal of ignorance and fail to understand the different motivations and attitudes that are held by the vast majority of the world’s population. Religion is, in fact, a broad and vague term, and yet it is too often used to lump a whole range of beliefs and faiths together as if they were in some way more or less the same and of equal value. If we are not willing to explore the differences between faiths and their accompanying political ideologies, how can we make sense of these increasing levels of persecution that brings fear and suffering to the lives of so many? The religious illiteracy that afflicts so many of us – including our politicians – reduces the empathy for those who hold tightly onto their faith and suffer as a result: we effectively reduce them to second-class humans, disregarding the basic human right of the freedom to hold religious beliefs. If this were not so, would there not be a more significant response than just a few MPs fighting the cause of religious minorities and concerned about the plight of persecuted Christians in particular? The suffering of women in countries where they lack basic civil rights is well supported and rightly so, but how is it any different for those who hold to a particular belief and are trying to get on with their lives peacefully and without prejudice? Dr Bhatti writes that his dead brother’s “strong, unwavering conviction and discussion with me always was that non-involvement is not an option; we are obligated being one human family to struggle for those who are too weak to speak and defend themselves”. Shahbaz Bhatti risked his life for this cause and paid the ultimate price. His brother has now stepped into his shoes and (probably) awaits the same fate. But in the eyes of both, this is a price worth paying for the sake of justice and freedom. Until more of our MPs are able to appreciate the scale of this catastrophe and how serious it is for the millions who live under the dark cloud of spiritual oppression, influential people like Prince Charles will need to keep banging the drum in the hope that the message will eventually get through.